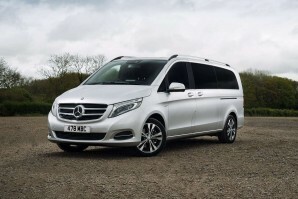 The Mercedes-Benz V-Class is one of the very biggest and plushest MPVs you can buy and represents a decent step forward from the Viano model it replaced. Yes, it has commercial roots, but they're very well disguised, with both interior and exterior styling and finish having progressed considerably since the last time the Stuttgart brand brought us a model of this type. If you want to carry seven or eight people and all their luggage - and do so with a bit of class, then this vehicle's worth a look.